Lord, we are both thankful for and overwhelmed by the mass graves the United Nations reported discovering. 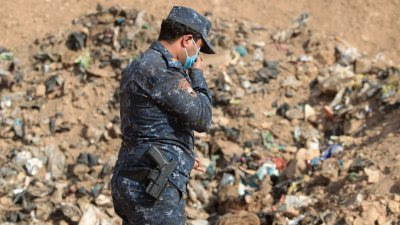 To know that over 200 mass graves, holding the remains of between 8 and 4000 people each, were created by ISIS in the northern and western Iraqi provinces is absolutely horrifying. These are the moments when we cry out, "How long, Lord?!" We cry out for vengeance against the wicked. We are disgusted by evil hearts that can mercilessly kill tens of thousands of children, women, men, elderly, disabled, police officers, etc., in the name of a supposedly holy mission. Yet, Merciful God, in the midst of our righteous anger, we acknowledge your character. We know you desire even ISIS members to come to know you, to turn their lives around, to become beacons of light in dark places. We ask for that. We also know that you will judge them someday, and if they do not repent and turn from their wicked ways, they will receive your wrath. We acknowledge your justice. We pray, Lord, for the monumental task of uncovering these crime scenes, of identifying bodies, of letting loved ones know what happened to those who quietly disappeared from their lives. We also pray that the day will come when these murderers will stand trial for their war crimes, and they will have to give account for the atrocities they have committed. We continue to pray against ISIS as they wreak havoc in this world. In Jesus' name we pray, amen.